Jamborees are always a good measuring stick for teams to see where they are as well as to showcase guys in front of tons of four year coaches. 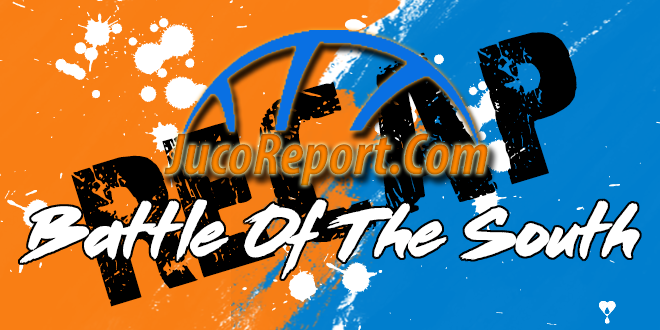 We started the preseason with Juco Report’s Battle of the South Jamboree in Duluth, GA. Several teams from Alabama were in attendance while Northeast Mississippi was the lone team from Mississippi. Northeast Mississippi went 3-0 on the day defeating some pretty good teams including two that went to Hutch last season. The three teams they were victorious over were Georgia Highlands, South Georgia State and Walters State from Tennessee. Georgia Highlands has had one of the best records nationally over the past three years and the Tigers ended up turning that game into a lopsided affair. Darius Williams (6’4” SG Soph) looked good in transition and went on a spurt of eight point’s straight one game. He was more under control since the last time we saw him in July. He’s being recruited by mainly low-mid major programs at this point and looks to be a key component for the Tigers this season who don’t have many sophomores. Conner McKay (5’11” G Soph) was dialing it in from deep all day and was consistent. He helped stretch the floor for and played with major confidence. McKay played off the ball a lot but can play solid minutes at a D2/NAIA program and really contribute. Felix Hayes (6’2” SG Frosh) was the X-Factor for Northeast as he lit it up from three. There was a game where he had to have made at least 5 or 6 threes and they were off the catch and dribble. He will be a key contributor this season. Snead State has some guys returning and they all looked solid. Payton Youngblood (6’5” SF Soph) has a big time physique and is tough. His midrange game looked pretty good and he was tough around the glass either finishing or rebounding. Chandler Davis (6’7” PF Soph) was physically imposing and didn’t mind banging. He was very patient in the post and used his size to move defenders. Davis was able to score from 15-feet in and crashed the offensive glass hard. He is hearing from several low-mid major schools with an offer from Tennessee State who was on hand checking him out. I really liked Brandon Wright (6’2” CG RS Frosh) and his feel for the game. He was crafty and always under control even when heavily pressured. His ability to get to spots on the floor and find open teammates was all created from his high IQ. Wright has a chance to be pretty good. Josh Freeman (6’5” SG Soph) looks like a kid who can play for a program like Belmont. His range is ridiculous and every time it left his hand it was primed to go in. In the first game against Andrew College, he was 4-6 from three and the two he missed rattled out. Trai James (6’0” PG Soph) shot the ball well from three and did a good job of running the team. He doesn’t “Wow” you but he is efficient and makes the right plays. Wallace-Hanceville is back at it this year with a completely new team and they didn’t disappoint. Johnathan Andre (6’6” SG RS Frosh) is smooth and has some size to his frame. He has a solid handle and shot it from three fairly well. Andre really looks the part and has picked up offers from Missouri State, Northern Arizona and Tennessee St thus far. Chris Rollins (6'6" F Frosh) is one of those old school guys that goes hard all the time. He was very active, athletic and posted well. Rollins is more of a four man right now and rebounded well in the second game. Jalen Hodges (6'6" F Frosh) is a tweener with a nice size physique who can play inside/out. He is tough and is similar to Rollins as both are interchangeable. Hodges puts it on the floor better at this point but both will look good together on the court with the intensity they bring. Marion Military has a few D2/Low Major guys that know how to play the game the right way. Mikel Davis (6'7 PF Soph) is an old school big who really gets good position in the post. He doesn't play outside of himself and is tough as nails. Davis doesn't mind being physical at all with his nice sized frame. He's a legit low major D-1 guy. Joshua Jones (6'1" PG Frosh) is a smooth guard who can see the floor. With his crafty handle he can get to spots on the floor. He made a few mistakes but he definitely looks the part to be a pretty good guard for the Tigers. Connor Zinaich (6'6" F Soph) is thin but a solid stretch four man who can shoot the midrange well. He has the frame of a three to defend on the perimeters. I would like to see him more during the season. We will be on hand this weekend at CBHoops JC Jam at Gordon State and a host of Alabama and Mississippi schools will be in attendance.